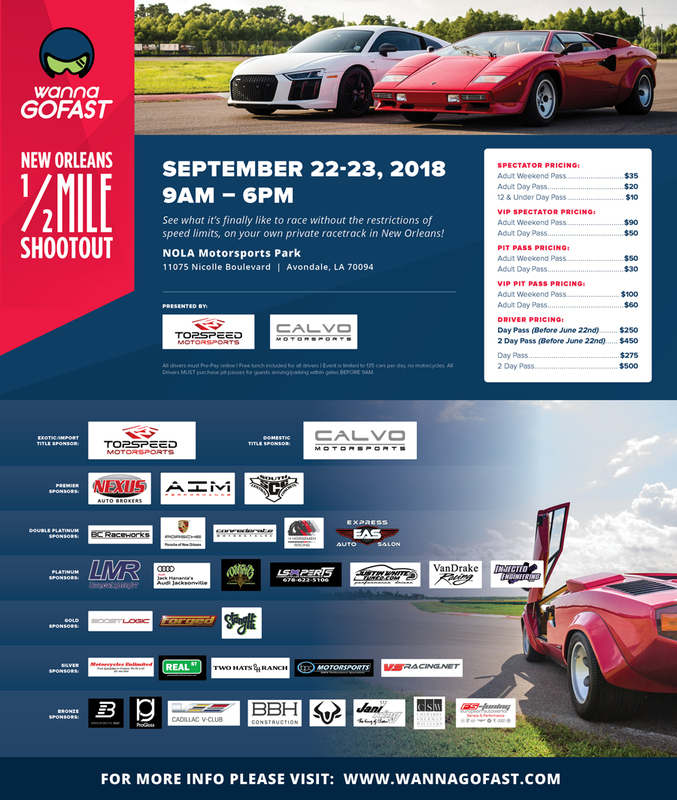 NOLA wannaGOFAST 1/2 Mile Event Sept. 22nd & 23rd 2018!! wannaGOFAST - New Orleans 1/2 Mile Shootout - September 22-23, 2018!! wannaGOFAST.com is proud to present the New Orleans 1/2 Mile Shootout!! This incredible 2-DAY event will be held on September 22nd & 23rd, 2018 at the world-renowned NOLA Motorsports Park. Located only 20 minutes outside of downtown New Orleans! Come join us for 2 FULL DAYS of, side-by-side, HALF MILE racing at this rare and exclusive location. All of our participants will be given a chance to take their vehicle’s Top Speed down NOLA Motorsport Park's 5300ft straightaway and race door-to-door against the competitor of their choice!! See what it’s finally like to race without the restrictions of speed limits, on what is basically your own private racetrack in New Orleans!! This event is limited to only 135 cars per day and is sure to sell out quick!! All Drivers will be allowed entrance to a 34,000 Sq Ft heated & cooled 2-story building with incredible views of the race, in addition to a 2nd story viewing balcony. Full Bar will also be available to those over 21 years of age who aren't racing in addition to food concessions. Spectator and Pit Crew can also access this building by purchasing a VIP Pass on our website. CLICK HERE to Reserve Your Room at The Roosevelt. Driver's CLICK HERE to register now for the New Orleans 1/2 Mile Shootout! Or you can visit www.wannagofast.com for more details! Drivers you must Pre-Pay Online! All drivers will be required to wear SA2010+ helmets for this event. Driver Registration Will Open On June 22nd, at 8AM CENTRAL TIME!! If you need to contact us please do so by emailing us at info@wannagofast.com or you can give us a call at 850-797-8579 and we will be happy to discuss any questions or inquiries you may have!